Play Jack and the Beanstalk slot online, the popular and feature packed slot machine from Net Entertainment and now with a custom version made specifically for your mobile phone; Jack and the Beanstalk Touch. 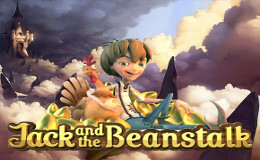 Another player favourite from Net Ent, the Jack and the Beanstalk slot machine uses immersive gameplay and fairy tale themed imagery to deliver a feature rich game with enjoyable action both on the reels with Walking Wilds and within the Treasure Collection free spins bonus game. Jack and the Beanstalk Touch has been developed especially for your mobile device, and plays wonderfully Windows Phone, Android and iOS devices. There is of course the regular version of the slot, playable on laptop, tablet and desktop PCs. Jack and the Beanstalk Touch has a payout percentage of 96.3%, with twenty fixed winlines across five reels. Stakes range from 20p up to £100 per spin, so all budgets are catered for. The slot uses the popular Net Ent Walking Wilds bonus whereby a wild will progress across the reels moving one space from where it landed per spin. Other wilds can land during this time and progress in the same way, potentially resulting in some very large wins. The main feature is the Treasure Collection with Free Spins which offers up the chance of some immense wins. Collect keys and wilds for some very large progressive wins along the way, as well as the standard reel wins to bulk up this highly entertaining feature. Jack and the Beanstalk is one of the most enjoyable slot games on mobile, the enjoyability is further boosted by the fact that it has been modified to fit your mobile screen perfectly, for ease of use and simplified playing controls. Play Jack and the Beanstalk at one of your favourite Net Ent casinos now.